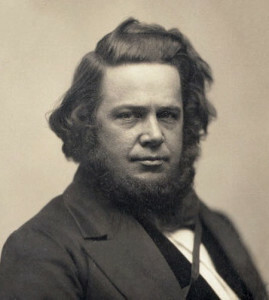 Howe was born on July 9, 1819, in Spencer, Massachusetts. He grew up on a farm and was fascinated by the machines used in his father’s gristmills and sawmills. Apprenticed to a manufacturer of textile machinery at age 17, he subsequently worked as a machinist in the cotton­ machinery industry. In the late 1830s, he overheard his superior tell someone that whoever could devise a small automatic sewing machine would make a fortune; he began to work diligently on the design of such a machine. In 1846 Howe patented his sewing machine, which incorporated two threads, the first lock­stitch mechanism, a curved needle with its eye near the point, and an automatic shuttle that moved one thread beneath the cloth. There was almost no local interest in his invention, so he soon sailed for England, where a corset manufacturer bought his patent and paid him a low wage to customize the machines for use in the sewing of corsets. Howe’s financial situation declined in England, so he returned to the United States in 1849. Upon his return the United States, he found that others (in particular Isaac Singer) were successfully selling sewing machines using designs protected under Howe’s patent, and he brought lawsuits against them for patent infringement. A long court battle ensued, ending in 1854 with the establishment of the seniority of Howe’s patent. He collected royalties from all sewing­ machine sales until his patent expired in 1867; he died in the same year on October 3, in Brooklyn, New York, leaving an estate worth $2 million. Howe’s introduction of the sewing machine revolutionized the garment­ manufacturing industry and made sewing less laborious for those who sewed at home. Like many technological inventions, the earliest sewing machines were resisted by tradespeople whose jobs were threatened by the prospect of mechanization. Indeed, in the 1840s the shop of French machinist Barthélemy Thimmonier, who had invented a crude sewing machine that was not to have a commercial future, was destroyed by tailors and seamstresses fearing loss of their livelihood. The Howe­ Singer court case brought public attention to the sewing machine. As people recognized the potential for speed and efficiency offered by the machine, they were willing to pay the relatively high cost. Improvements in the machine and manufacturing efficiencies eventually made the machines more affordable. The sewing machine is credited by some historians as the first item of the Industrial Revolution to significantly lighten the workload of the housewife. While an experienced seamstress could complete as many as 30 stitches per minute, Howe’s earliest machines could reel out 250 stitches per minute. Machines could also sew tough fabrics that were difficult, dangerous, or impossible to sew by hand. Technological refinements made since Howe’s time have produced many versions of the sewing machine, from the common household appliance to the sophisticated, powerful machines used in various industries. Many machines are designed to sew particular items, such as hats, shoes, embroidered material, denim, leather goods, silk, and hardy outdoor clothing. Howe’s machines were powered by a hand ­driven wheel; the advent of electricity in the late nineteenth century made sewing machines faster and easier to operate. The newest machines take advantage of microelectronics and incorporate push­ button controls. However, Howe’s sewing machine included basic elements that remain unchanged in modern sewing machines. Needles still have their eyes located near their points. Modern machines use two threads, one below and one above the cloth, to create a lock stitch. Posted on March 8, 2015 by Natalie. This entry was posted in Inventors. Bookmark the permalink.